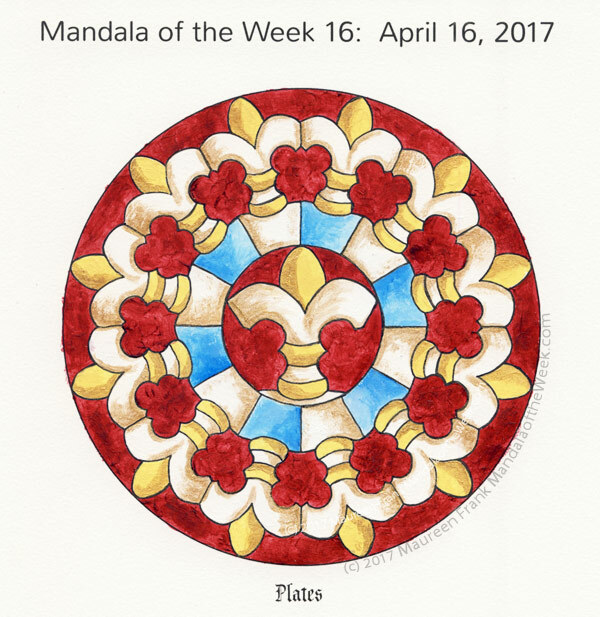 I present my coloring/painting of this week’s Mandala of the Week: Plates (from Sunday’s MotD post). I gave this mandala a rather regal look to it with the use of alizarin crimson, yellow, white, blue, and gold. I like how it has a bit of a stained glass window look to it as well. In a more abstract view, it looks like 13 people in a circle, each wearing white robes with gold belts (and gold faces), raising their arms in joy as if ecstatic to see us. For this painting, I used M. Graham and Golden acrylics, Golden iridescent & gold paint on Canson’s mixed media paper, enhanced it with a black micron pen.